One of the great things about having a nice sized back yard is all the fun things we get to build. My husband has been falling trees to make more room and along with that there has been a lot of branches and brush to burn. It's become overwhelming. I was surfing Pinterest yesterday and came across the most amazing idea. A teepee made out of branches. It was perfect. 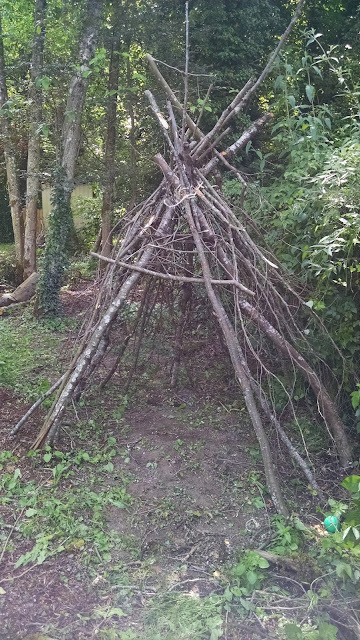 My husband and I set about making this beautiful monstrosity in a little corner of our yard so it would not be disturbed by any more falling trees. The results, a lovely structure for our boys to play in all summer. I plan on growing some Ivy and Morning Glories all over the outside to give it more shade and beauty. Its going to be awesome by the end of the summer. Have any teepee stories? Send them to Shendersonphoto(@)gmail.com and I'll share them with my readers.